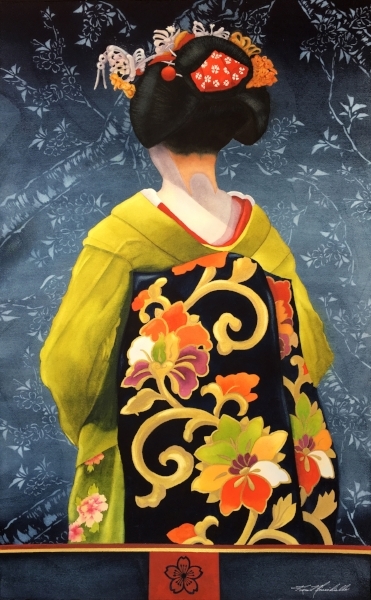 of the Watercolor Society of Alabama! This painting allowed me to play with the moodier side of color. You all know how much I love Venice and this Mary's home is inside the Chiesa di San Salvador, close to the Rialto bridge. to be a part of this prestigious show! from June 2 to August 2. Reception is Sunday, June 2, from 1-4pm and everyone's invited! My painting will be available for purchase at the show or through me. Come, and bring your non-painting spouse too! Saturday I really put Daphne to the test. 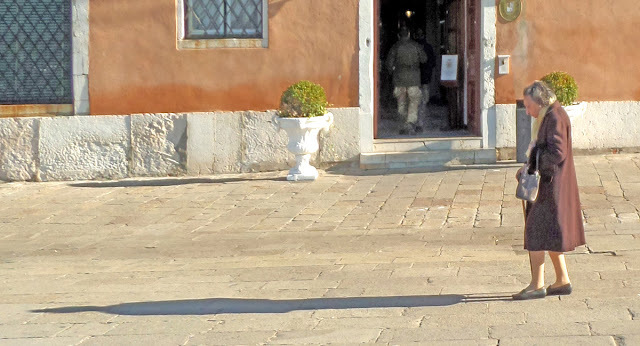 If we're going to sketch Venice in real life, we'd better practice sketching canals right now. I was a bit scared for her (and for me...I figured she'd balk, or worse). I showed her the following photo, pointed out a few things like "See how the reflections fall right below the buildings themselves?" and "See how the building on the left disappears off the page at the top?" I saw her looking at the photo and I thought maybe her eyes were glazing over when I heard her say "I totally understand what you're saying." I leaned in and said "You don't understand what I'm saying?" "No. I TOTALLY understand." (She's 6.5!) That was my cue to say "I'm leaving you now to draw. See you in a few." remember this photo was the one I painted from. she "drew the details last". That's my girl! What do you think!? Other than some angle issues (perspective issues...which even my adult students encounter! ), she completed it beautifully in about 20 minutes. We leave for Venice in 2.5 weeks. My itinerary will be slightly different this trip because I don't want to take her where it's crowded (I'll share our itinerary at some point...I'm hoping to see things I don't usually get to see). I typically stay away from crowds anyway, but at some point you do have to go through them or around them (although April is a splendid time when tourists have not quite arrived en masse). P.S. in the reference photo she worked from, she saw the flag in the top right and asked me about it. These are hung throughout Venice and the lion represents St. Mark, the patron saint of Venice. 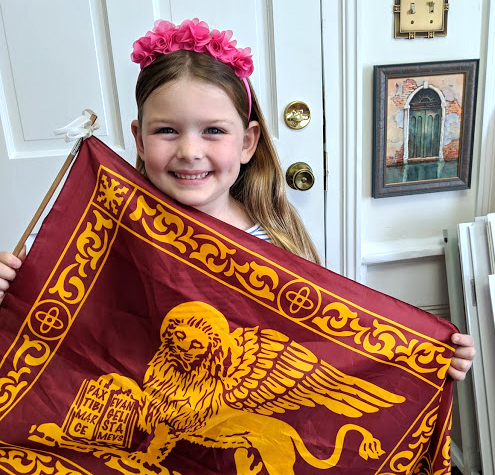 I myself own 2 Venice flags so I gave her the smaller of the 2 for her room. Happy camper = Happy grandma! 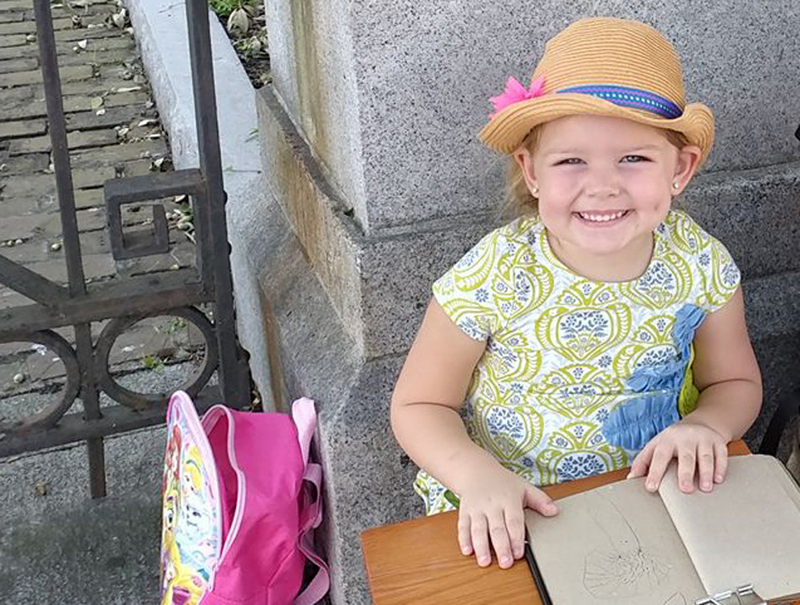 So...please tell me if you've ever taken your grandchild on a trip with YOU! Where did you go? What did you do? HOW did it go?? 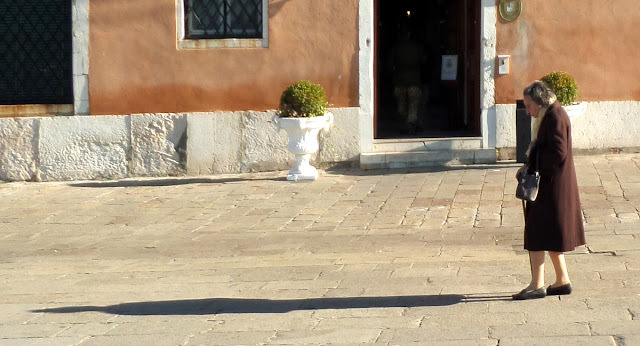 When Antoine decided to join us on this Venice trip, I wanted to be sure he wouldn't be bored, because Daphne and I will sketch or paint every day (probably all day long, since it's her favorite thing to do). Antoine reassured me and said he might actually paint with us! As a child, he was good at sketching, but real life got in the way of things creative although I'm sure he'd say golf is his creative outlet! 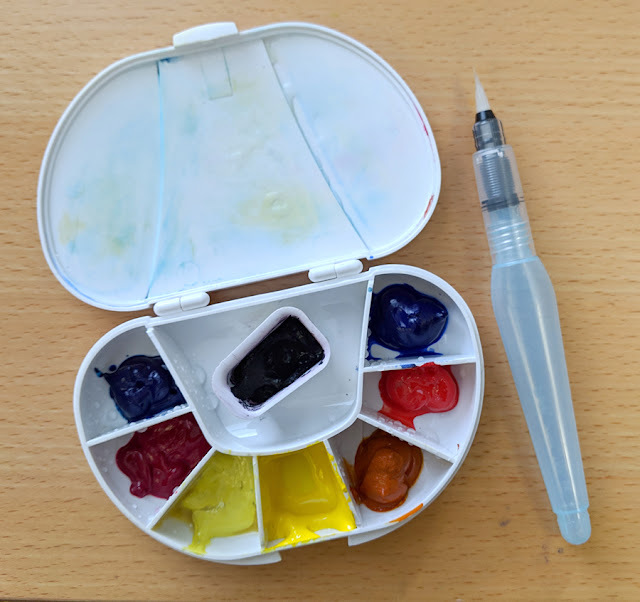 As part of my effort to get him up to speed quickly, I've created a tiny TRAVEL PALETTE for him (it's actually a pill container!). I've included 3 cool colors, 4 warm colors and I've added Shadow Violet by Daniel Smith which is a color I can't live without lately. It plays so nicely either by itself or mixed with other colors. 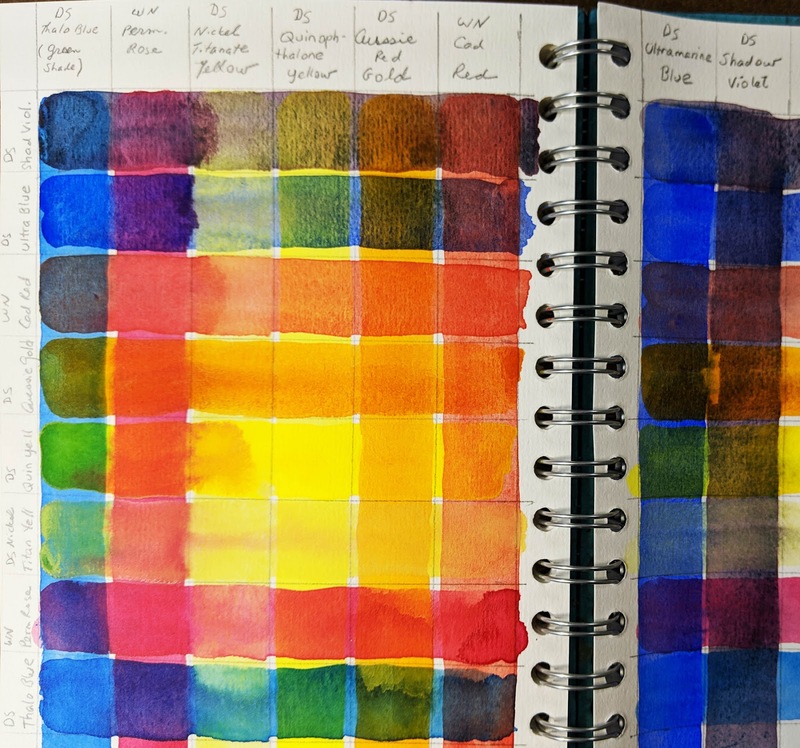 Pigments from left: Daniel Smith (DS) Thalo Blue (green shade), Winsor & Newton (WN) Permanent Rose, DS Nickel Titanate Yellow, DS Quinophthalone Yellow, DS Aussie Red Gold, WN Cadmium Red, DS Ultramarine Blue, DS Shadow Violet (in the center). The first 3 are cool colors. The other 5 are warm. You really could use whatever cool and warm colors you already have, but try to stick with blue/red/yellow since there are not many wells. You may buy the water brush HERE. 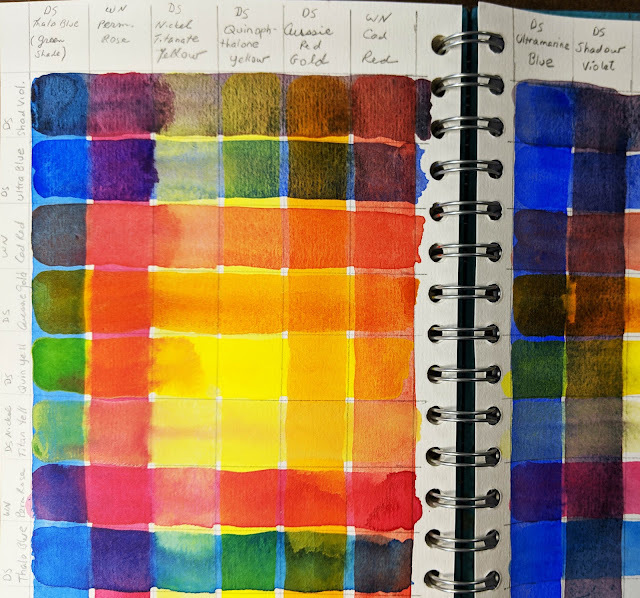 Then I created a chart in the back of his SKETCH BOOK that shows him what every color looks like, painted over every other color. Look at all the colors you can create with just 7 colors! Check out the variety of greens w/o one single tube of green being included! I used a PINK PIG 270g A5 Posh Banana Watercolor Book, but when I went to find it online for you, it's only showing up on Amazon UK. I do believe I actually bought it through them and it shipped to me in about 2 weeks' time. The price is right and the paper holds up very well to lots of water. Check it out HERE. The colors bled only because I didn't wait long enough to cover the initial color with more color. I knew better. For Venice or France, I particularly like the combo of Shadow Violet with all of the other colors (as shown in the top row of the chart)! 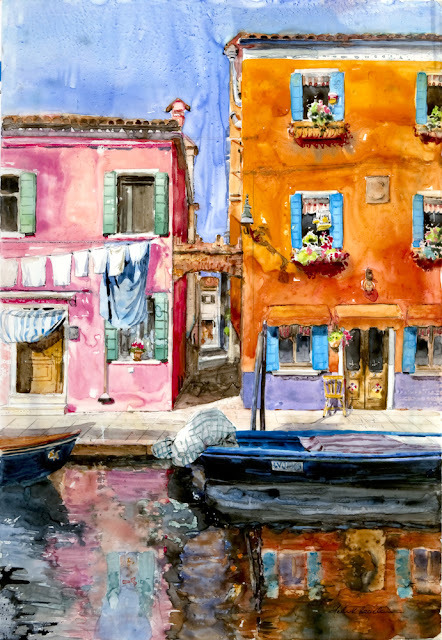 Except when you're on the Venetian island of BURANO, when all of the other brighter colors will come into play! Even though I use all kinds of travel palettes, I'm planning on all 3 of us using this new mini version in April. I'll let you know what Daphne thinks about that in a future post! We're really starting to get excited now! 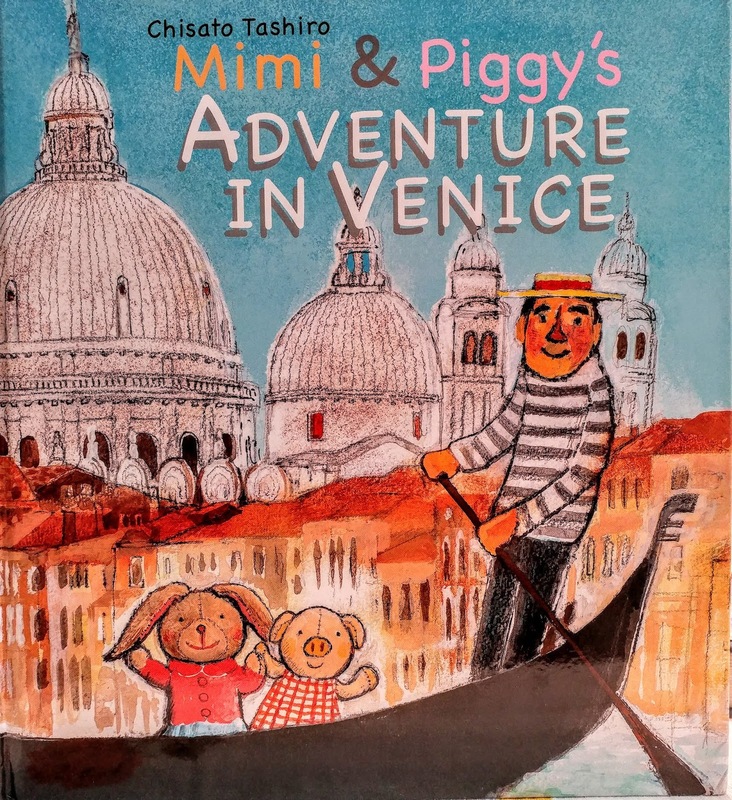 You may also enjoy "Daphne Goes to Venice (Part 1)" HERE. This coming April, I'm taking Daphne (my youngest granddaughter) to Venice with me. With us will be her Daddy (our son), one of her favorite people on Earth! I'm excited he's coming too because we never get to spend much time together and he's heard me talking about Venice for years. He might as well see what all the fuss is about! About 1.5 years ago, after one of my Venice trips, Daphne (then age 5? ), listened very attentively to my travel stories. 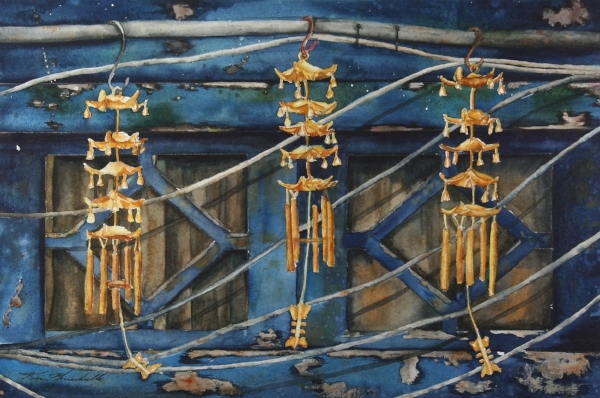 She took me to one of my watercolors hanging on their wall, and said, "tell me again about the bird in the cage?". She listened again, as I told her the story of sitting across the canal from these colorful buildings on Burano (an island in the Venetian lagoon, just north of Venice). I told her that an older lady was playing piano from the top window in the orange house. I told her that there was a birdcage in the window below that, where a canary sang for us while we painted! Daphne, with truly innocent eyes, looked at me and said "I'm going with you one day, Oma". Oh, boy. I was smitten and then I spent a year working on her parents to get the okay to take her. And now we're actually going! 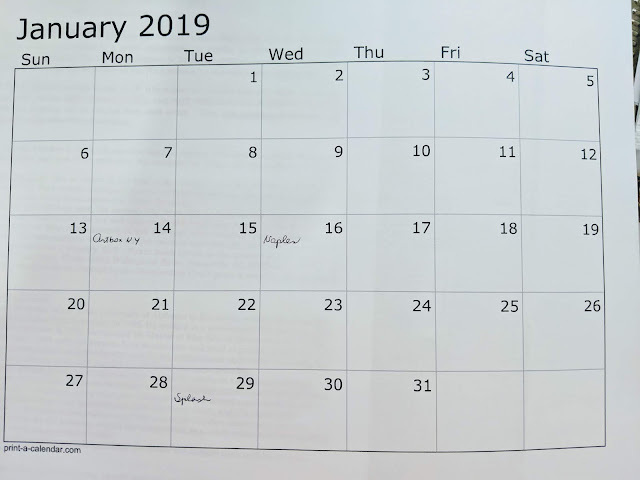 Planning is half the fun, BTW. 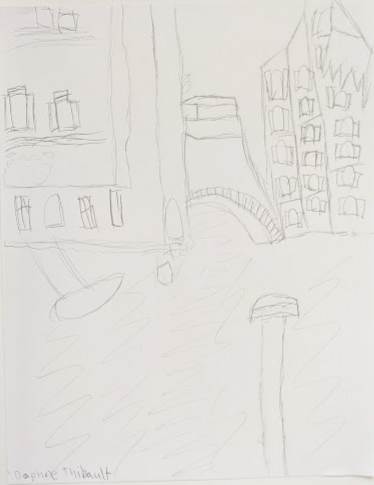 She's our little artist, so I've already got her drawing from some of my Venice photos so that she gets used to the different architecture and colors. She spent the night this week, and together we read the story "Mimi and Piggy's Adventure in Venice". Book by Chisato Tashiro. Find it HERE. I think I'd like to record our story as time goes by. If they bore you, just delete-delete! I wish you and your families a very Happy Thanksgiving! I'm grateful for each of you that have touched my life. I wish I could repay the bounties!! And YOU can come with me! Early Bird fees (thru this Dec 15) apply! Sightseeing trip to Cinque Terre, Italy (or elsewhere TBD). Let me know if you'd like info as it develops. 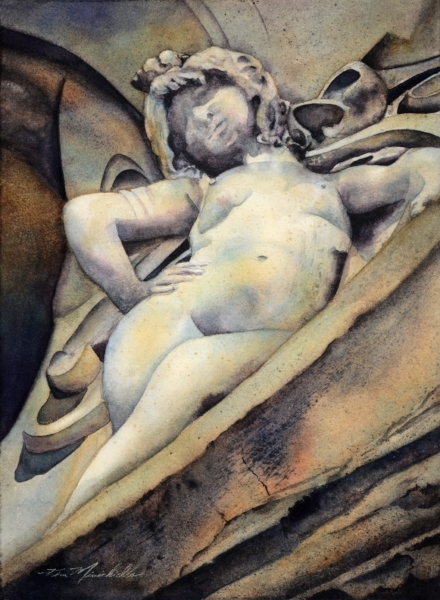 Tippette = Snippet of a Tip (in watercolor). HOWEVER, if that's not YOUR thing, consider drawing (lightly) with a neutral watercolor pencil and your pencil marks will dissolve when you touch them with water and/or watercolor pigment! 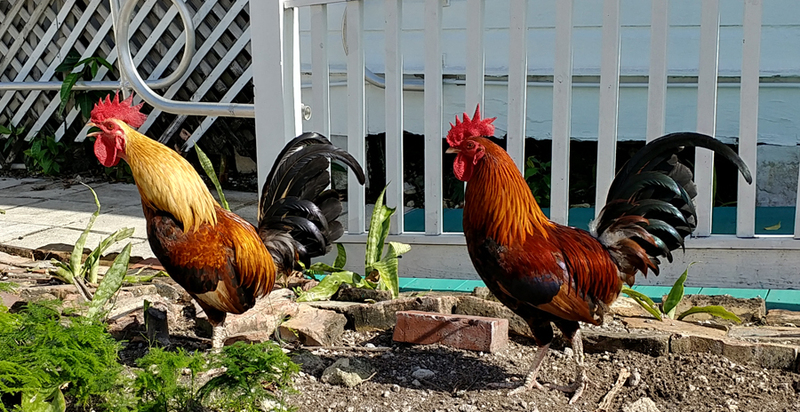 Early Bird fees (thru this Nov 1) apply! Sightseeing trip to Cinque Terre, Italy. 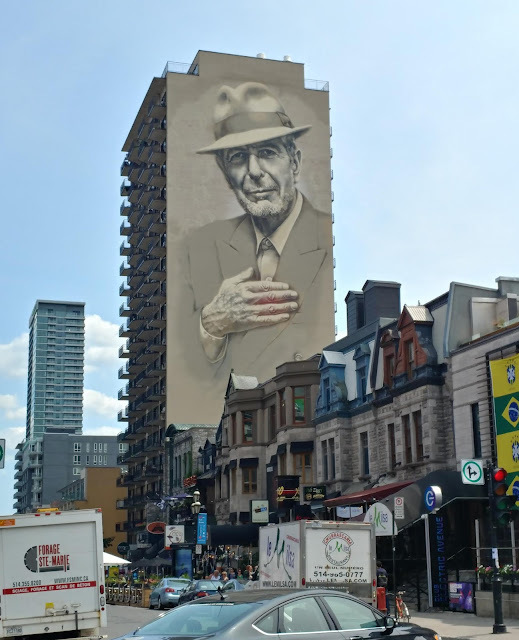 Beloved Leonard Cohen, on Crescent Street. Here's a real life example of why artists shouldn't rely solely on photos for reference. 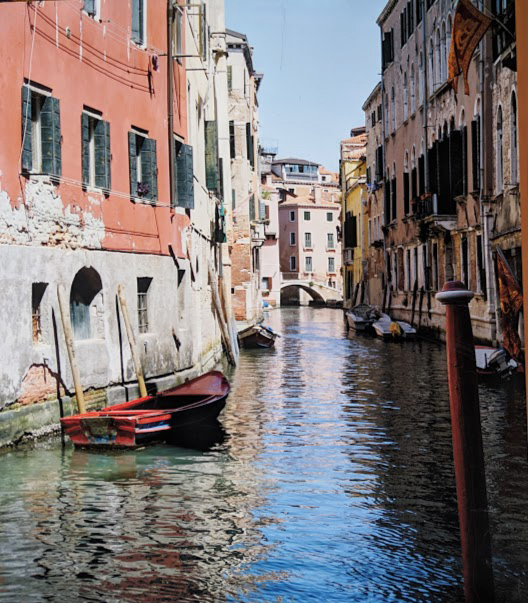 I took this photo in Venice...I'm in the process of painting it (or at least a stylized version of it...stay tuned...not sure myself what it'll morph into). Today's Tippette: Photos lie, especially in the darkest portions of a photo. Just look at the difference between the reference photo and then the lightened up version below it. Get ready to be amazed! So hard to tell what's going on in the darks. Lightened up version (use any photo editing software). No way I saw that door open, with a man walking through it. Unfortunately for him, he won't be included in my painting. But now I have to figure out what to do about the door...hmmmm. Luckily, I have MUCH experience with painting doors! Well? Were you amazed by how much detail was hidden from me? The answer for an artist working from photos is to be sure you know exactly what's happening in your dark areas or you'll end up with a black hole that nobody wants to go down. I hope these periodic tippettes help you in your painting journey. 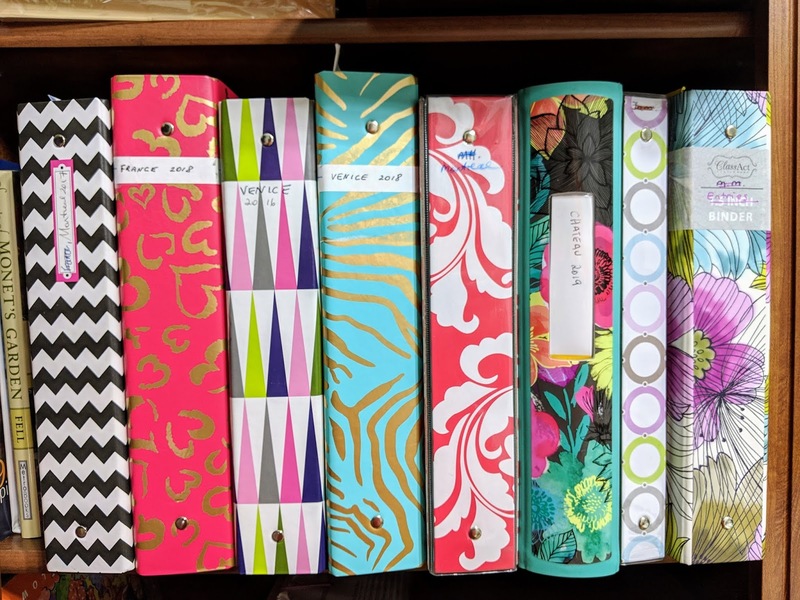 Ask me anything in the Comments (or email me) and I'll either direct you to an existing tippette, or I'll write a post with my answer. Remember to sign up to receive my blog automatically, sent via email to your inbox! Let me know if you have trouble doing that. 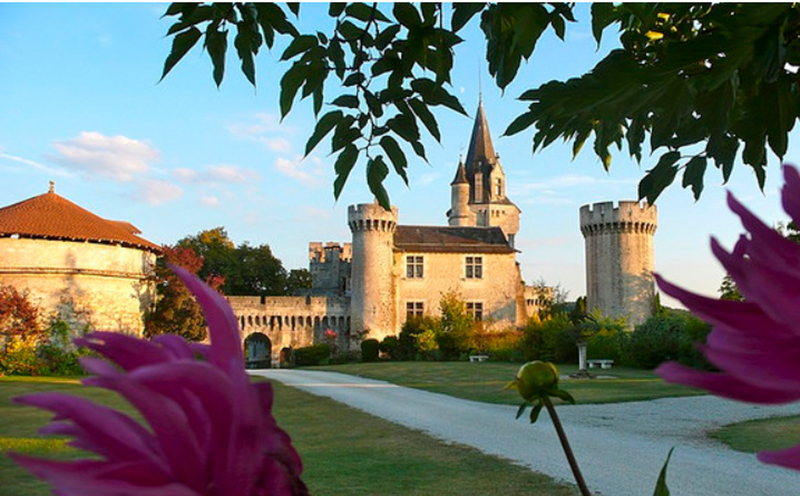 In 2019, I'm teaching at a castle in France! Won't you please share my post with a friend?? Non-painting spouses are also invited! Yay! If 2018 is a better travel time for you, I still have 2 spots open in both my France and Venice workshops! You could even do them back-to-back! 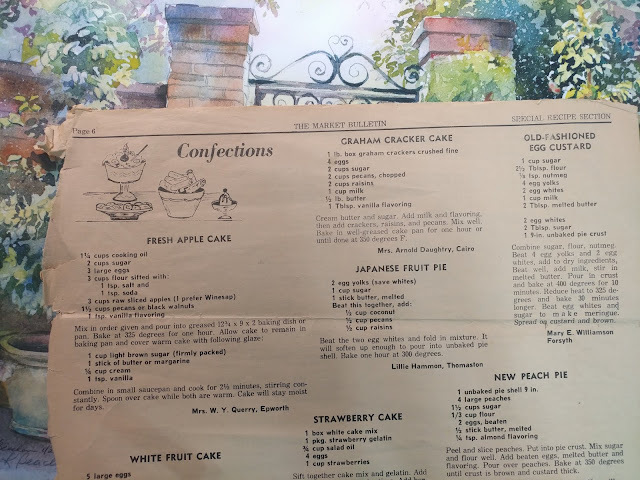 A Recipe from the Past & a Castle in 2019! The Graham Cracker Cake sounds easy enough to try! 1 lb. box graham crackers, crushed fine. Cream butter and sugar. Add milk and flavoring. Add crackers, raisins and pecans. Mix well. Bake in well-greased cake pan for 1 hr or until done at 350 degrees. When would YOU add those 4 eggs??!! And listen to this...in 2019, I'm teaching at a castle in France! 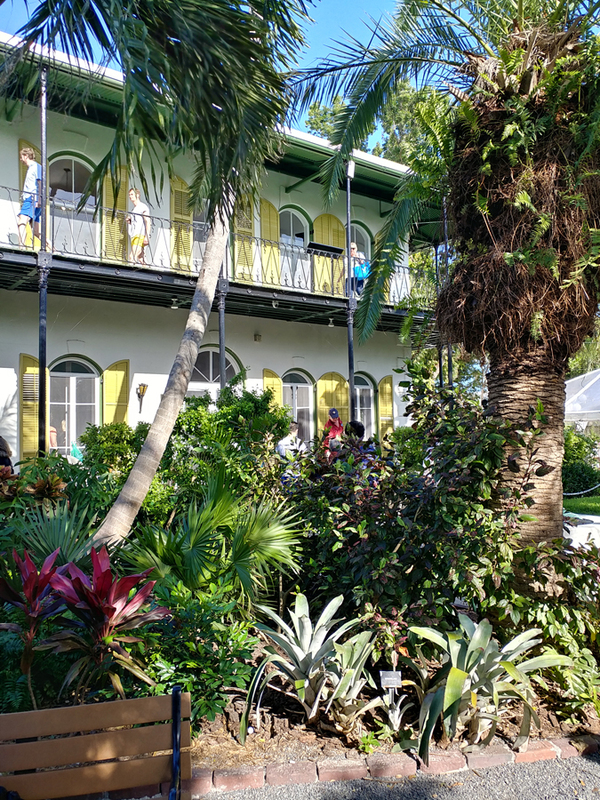 I just came back from Key West. 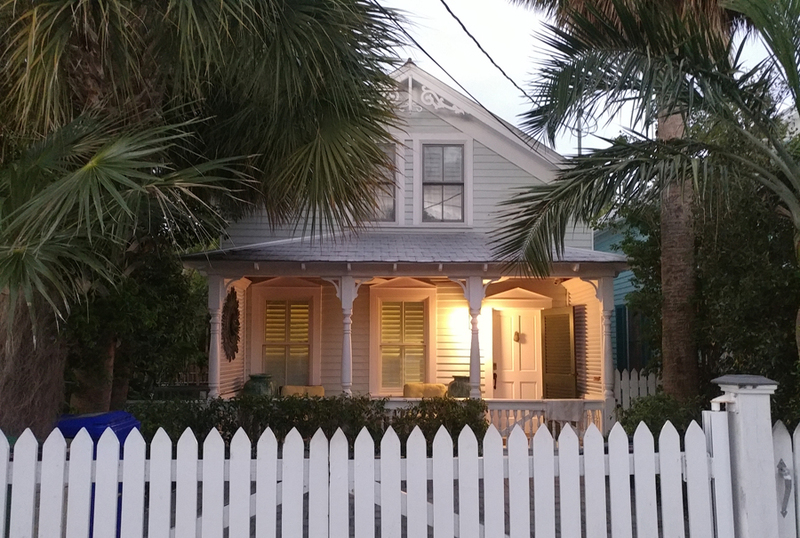 Loved the little cottages with picket fences and the fabulous restaurants we ate at! I see a new series on the horizon! Meet Rhett & Scarlett (or maybe the reverse??). 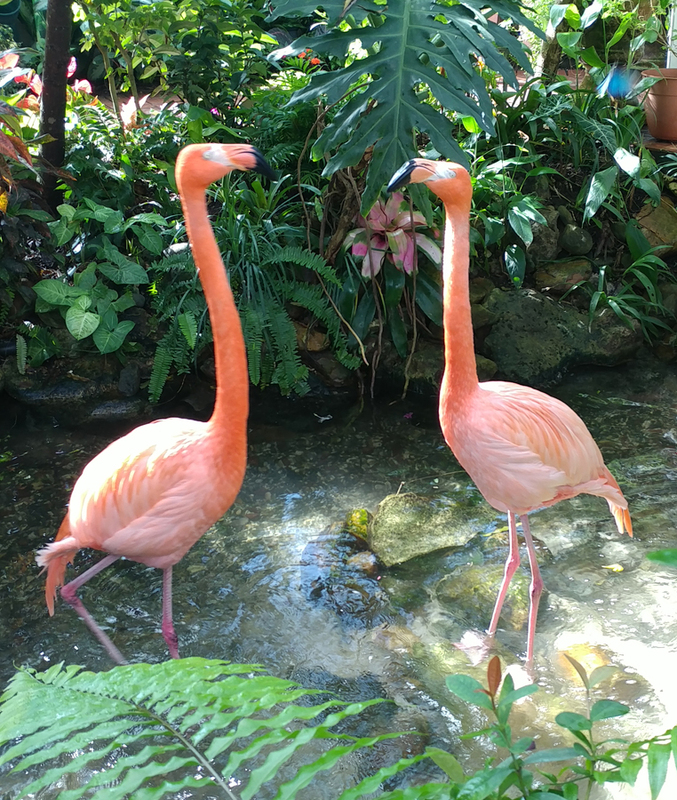 They live at the Butterfly Conservatory, which is a Must See. 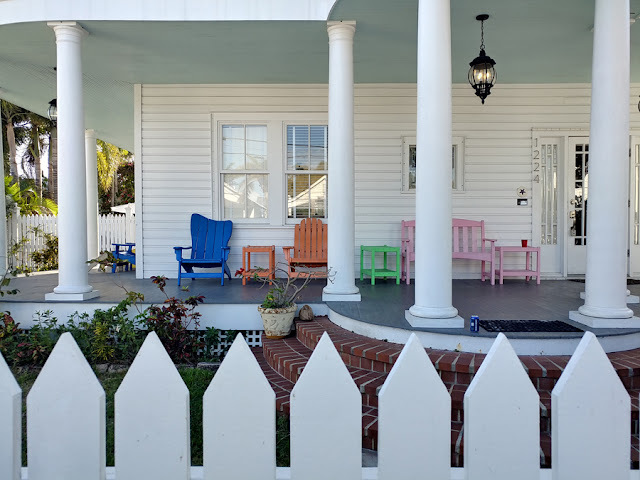 He built a 6' high brick fence around his house to keep out the "riff raff" after Key West started using him in their promotions for why you should visit the island. 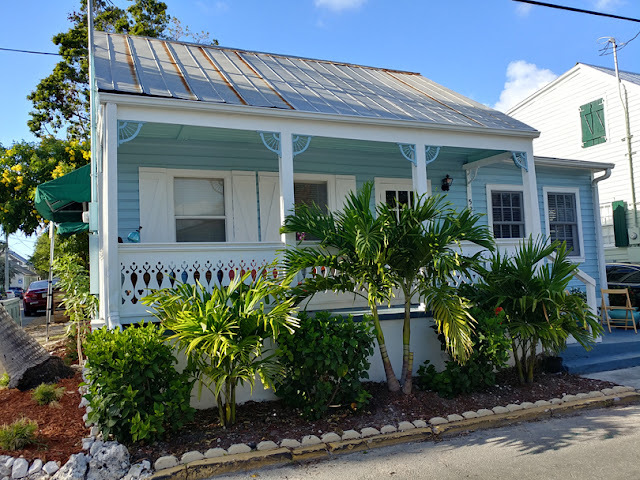 I'm now listening to the audiobook called "Last Train to Paradise" which is about Key West and the railroad. Whereas I thought it was going to be a documentary, I was pleasantly surprised to "hear" that it's actually a novel based on reality....and the opening paragraphs involve Ernest Hemingway himself! I plan on listening while painting my Key West series! (and thanks to Kim Minichiello who recommended the book to me, and who came to Key West with me, along with Anne Peterson)! It was a spontaneous trip that didn't disappoint! Me: You paint in oils and in watercolors. Which is your favorite and why. Kim: I painted more in oils than watercolor a few years ago. 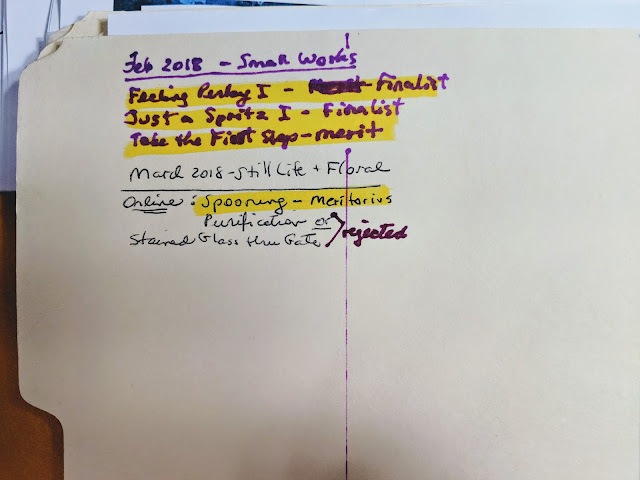 Then when I knew we were going to move to Hong Kong, and we would be doing a lot of traveling, I had the desire to keep a watercolor sketchbook travel journal. So essentially, I used the skills I had for oil painting, drawing, composition, color mixing, value and edges, and just adapted it to the new medium. Plein air sketching is really how I got started painting in watercolor. At one point, I wanted to challenge myself to work on larger paintings after working in sketchbooks. Once I did that, I really fell in love with watercolor and it has become my primary medium. I love the portability of it for plein air painting and sketching, as well as the feeling of water and pigment flowing on the paper, sometimes in unpredictable ways, and the challenge of learning how to control it to get the effects that I want. I feel a lot more planning goes into a watercolor painting to figure out the best way the painting is to be painted. 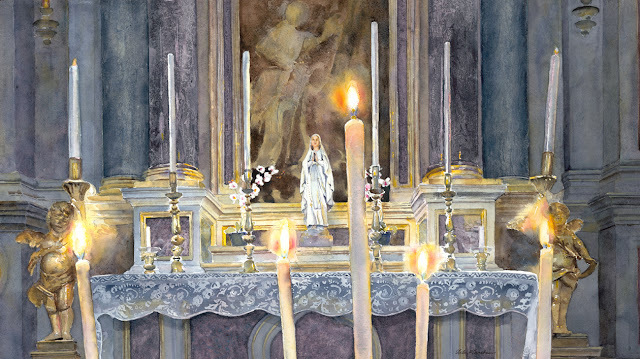 For example foreground first or last, each section at a time or work on the painting as a whole. The design and that planning are just as enjoyable for me as the actual painting process. I also just love paper, and enjoy painting on it. For oils, I like the thicker viscosity of the paint and enjoy moving the paint around with loose brush work like putting icing on a cake! Watercolor mounted on board, 12" x 12" x 2"
Me: What’s the largest sized watercolor you’ve ever painted? What subject did you choose? Why did you paint it that big? 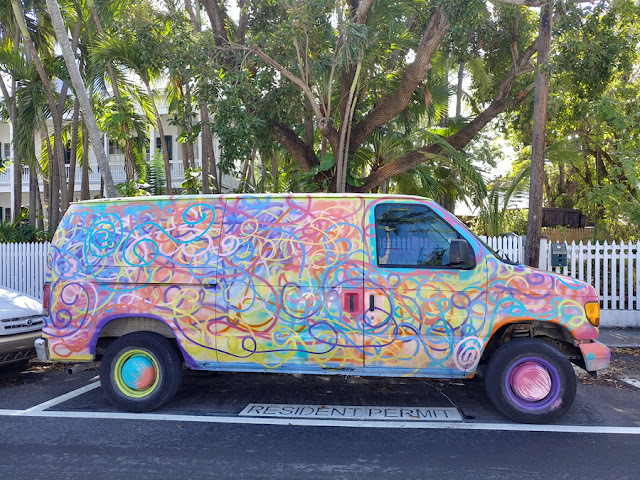 Was it a commission or were you painting to enter a show? 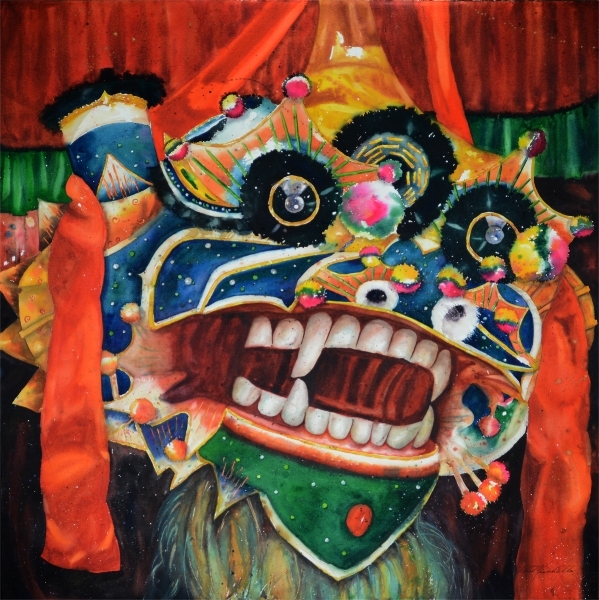 Kim: The largest watercolor I have ever painted is a 36” square piece titled "Lion Dance". It was inspired by the Lion Dance performances my family and I saw during the Chinese New Year celebration right after we moved to Hong Kong. We were at the Cultural Heritage Museum in the area of the museum that celebrates the various festivals that take place at different times of the year in Hong Kong. It was an intimate setting and the performance was loud, kinetic, colorful and full of life. I got a lot of great pictures and wanted to do a painting that was bold, colorful and “in your face” if you will. Painting the main mask of the dance costume large just seemed appropriate to the feeling I wanted to convey, reflecting a memory of a unique time in a city that was always mesmerizing to me and made me feel happy to be there. I painted "Lion Dance" for no other purpose than for myself, to reflect on my time in Hong Kong and enjoy the process of painting big! However, it has had the opportunity to have appeared in a few shows, with pretty steep shipping costs! Me: Were the challenges different when painting that large versus painting small? How so, and how did you overcome them? Kim: When I work on a composition, I guess I have an intuitive feeling on the size I would like the subject matter to be. I only limit myself to the width of a roll of paper. I have not taken advantage of the 45” width but plan to someday, as well as trying some elephant sheets! The challenge to painting large is having the space to accommodate a large painting while you are working on it. I feel fortunate to have a very large drafting table I use as my painting table, as well as a padded layout table built from 2 x 4’s and plywood I used to do textile work on. When working large, it’s a bit trickier in watercolor than any other media. You will have areas that require larger washes. I make sure I use large brushes that hold more water, as well as mix up larger puddles or cups of paint to have at the ready when I start to paint that area. There is nothing worse than running out of paint when you are in the middle of painting a wash in a large area! I feel working wet in wet helps for large washes as well. As far as painting small, I have painted pieces as small as 6 x 6 and 5 x 7 and even smaller in a sketchbook. My biggest challenge for me now are my eyes! I’m far sighted and wear reading glasses to paint. Just the last 2 paintings I have worked on, I have had to introduce a new pair of stronger reading glasses to paint details. Right now, I’m doing the “glasses dance” between the two pairs while I’m painting! I still try to use the biggest brush possible when I’m painting small, it helps me not to get too nit-picky. For me, the key to painting big is to use BIG brushes and mix up lots of paint. The key to painting small is I try to not get too detailed. I try to break things into simple shapes and suggest rather than render every little detail. 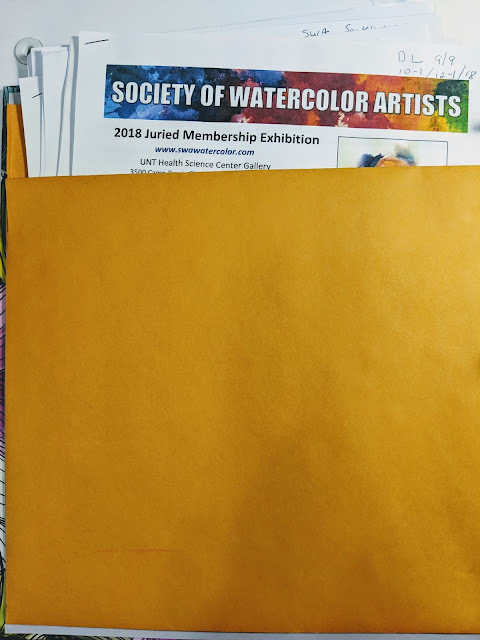 Kim: I’m a signature member of the Georgia Watercolor Society(GWS) which has a national show, the Louisiana Watercolor Society (LWS) and the Pennsylvania Watercolor Society (PWS) which both have international shows. I feel I must have had really good judge karma for those shows, because I got in each show the first time I entered and then the two years after, so it only took me three years. 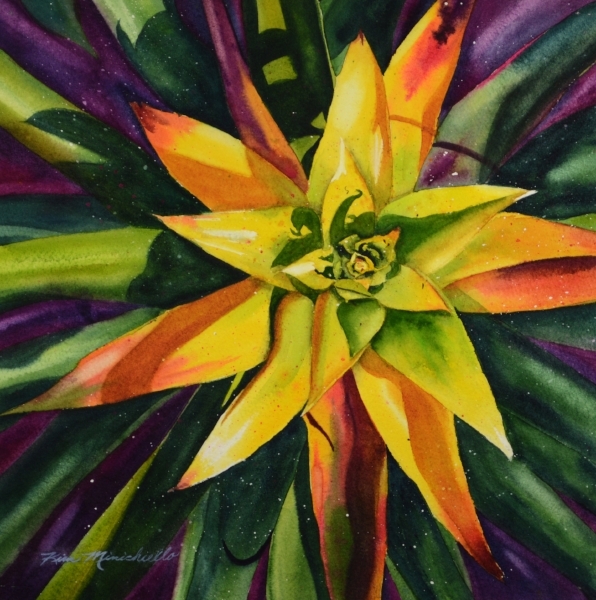 I’m also one year away from getting signature in the Florida Watercolor Society(FWS). This one has taken a bit longer. I got in the first time I entered but have had a dry spell with that one for a few years. I have had lots of acceptances into various shows, but have also had my share of rejections. What one judge rejects one time, another one will like it and want it in a show. 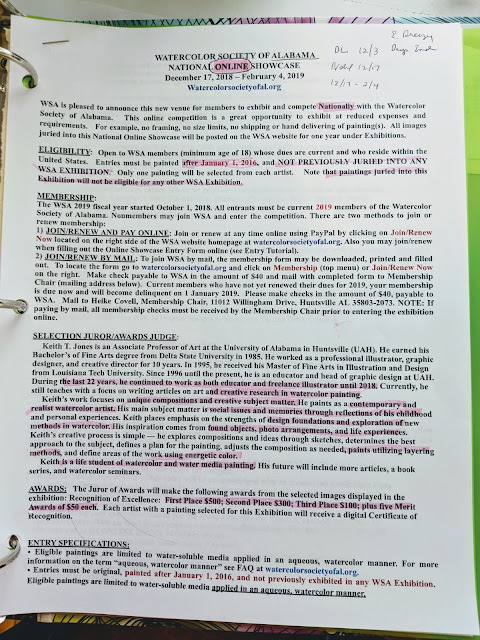 A fellow FWS artist and friend entered the FWS show one year and got rejected. The next year she entered the same painting, different judge, and received the top, best in show award! You just never know! Recently, I've been accepted into the American Watercolor Society 151st Exhibition, won one of the top awards, and my painting was selected for the 2018 AWS Traveling Exhibition. The same painting also won third place in two categories in the International American Art Awards competition. However it has also been rejected from a few shows. I feel the moral of the story is, if you believe in the work, keep entering! 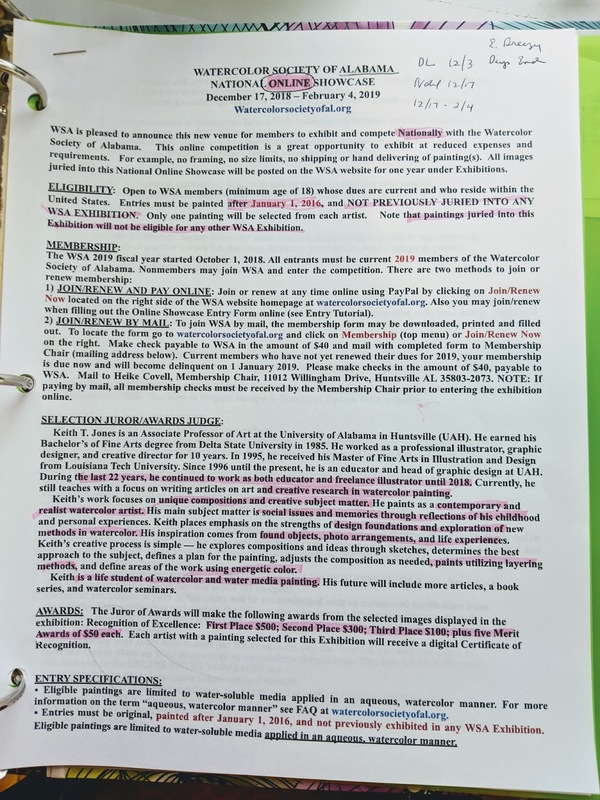 Don’t let a few rejections dissuade you from entering other shows or any show at all. Me: You came to Montreal with me last July. What expectations did you have, and what observations did you make after the trip was over? 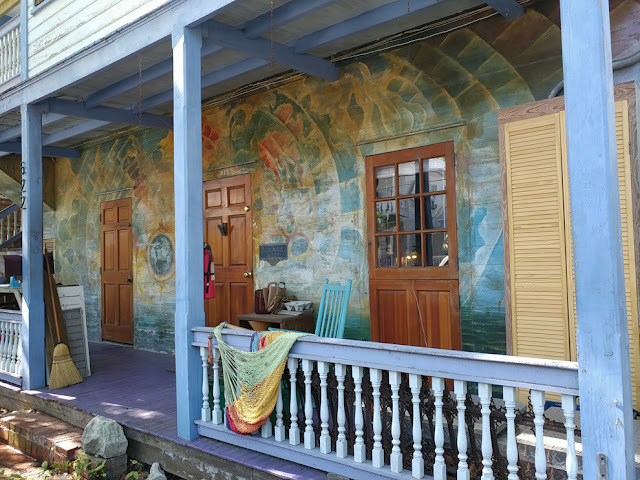 Kim: I was so excited to explore your home town, and spend time with all of our WAM Members. I find traveling with you all is so inspiring in so many ways! I feel we really give clarity to and inspire each other, especially when we are all together. Every trip we take, I look forward to a good dose of that as well as enjoying each other's company. I love exploring and learning the history and story of a place. For me, it can be very random. What I see might inspire me to take an idea further and create a painting or series of paintings. I also like to get my museum fix when I travel. I’m a museum junkie! 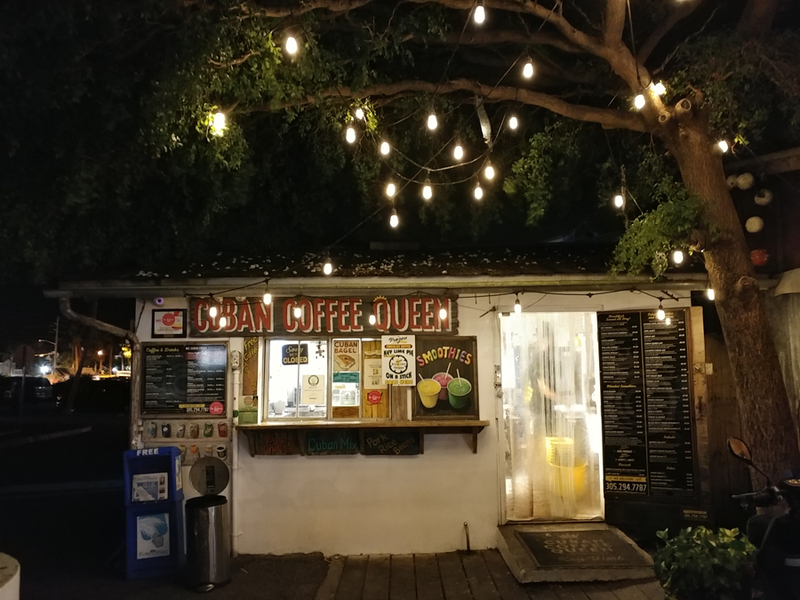 I don’t know if I had any expectations other than I thought maybe the older more historic area of town might be smaller and more quaint like a European village. Even so, it felt very historic yet meshed with the vibe of the metropolitan feeling of the city in a good way! I really enjoyed my time there and would definitely go back! One bonus for me is that I could practice my French since everyone is pretty fluent in both French and English. That way, if you get stuck you can always revert to English. Overall it can’t be beat! You have a great city experience that feels a bit foreign from the U.S. so you sort of get a European fix without going too far. Culturally it was wonderful, loved spending time in the museums as well as exploring some residential areas. Didn’t have a bad meal...the food was great! I highly recommend the Botanical Gardens there, which include a Planetarium and Insectorium near the Olympic Park Stadium. Since my husband and I are Formula One Racing Fans, we may go to the Canadian Grand Prix there some day too! I hope you enjoyed meeting Kim. I'm proud to call her my friend. 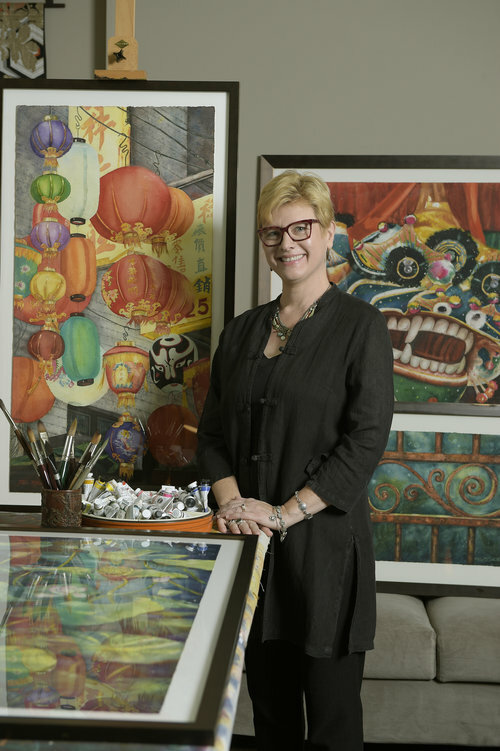 She is currently VP on the Board of the Florida Watercolor Society and will be President in 2019. She and I are both members of WAM: Women. Artists. Mentors (follow our Facebook page HERE). Other members are Carrie Waller, Debra Keirce and Maria Bennett Hock. And to see more of Kim's fabulous work, to check out her classes or to sign up for her Newsletter, visit her website HERE.